Food & Beverage | Indelac Controls, Inc.
Food and beverage applications demand actuators that are durable and reliable. They must be able to operate for long hours and be capable of withstanding frequent high-pressure hygienic wash downs that expose equipment to a variety of materials, including detergents, steam, caustic soda, citric acid, and other chemical solutions. These chemicals can be highly aggressive towards metal components, so the selected actuator must be appropriately designed with adequate levels of corrosion resistance. 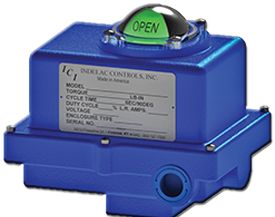 Indelac Controls, Inc. (ICI) provides a full product line of electric actuators that have been specifically designed with features that make them ideal for operation in the food and beverage industry. Our NEMA 4-compliant housing enclosures protect electrical and mechanical components from incidental exposure to splashing water, food particles, and other mild liquids. For enhanced corrosion resistance, our NEMA 4X-certified enclosures protect the actuator and its components from the corrosive agents present in chemical washdowns. This provides a viable alternative to shielding covers, which can complicate designs, occupy valuable space, and interfere with maintenance. Facilities that produce fine or powder-like particles – such as flour mills – require even more specialized equipment. High concentrations of fine particles in the atmosphere may create ignitable, flammable, or explosive environments. For these applications, ICI offers actuators enclosed in explosion-proof NEMA 7 and NEMA 9 housing units. These enclosures are available for 12VDC and 24VDC power supplies and are rated for operation in Class I and II environments. If you would like to learn more about our electric actuators, please contact us or request a quote. Our technical team is ready to assist you in finding the perfect actuator for your application.